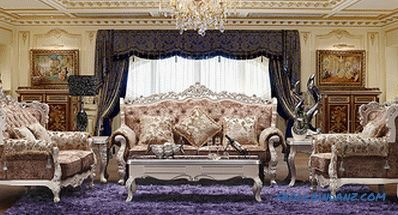 Baroque style in the interior is a luxurious aristocratic style, which is designed to demonstrate the power and wealth. It is peculiar to theatricality and dynamic images. 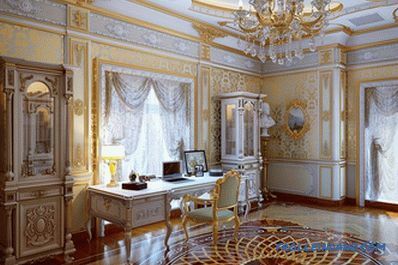 It allows you to emphasize the high status of the owner of the house due to the use of valuable finishing materials and furniture, art objects as a decoration of the premises, gilded surfaces with inlay. 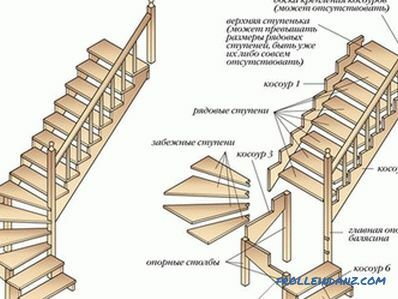 The history of the Baroque style Russia. 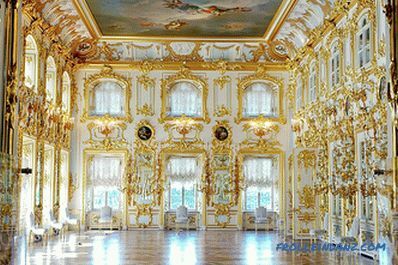 This is the palace style that formed the magnificent image of the famous monumental architectural ensembles - Versailles, Peterhof, Schönbrunn. The procession of this style around the world began with Western Europe. Scattered German principalities, Italian and French cities were the first to see the luxury and magnificence of the buildings and baroque interiors. The style penetrated into Russia a little later. 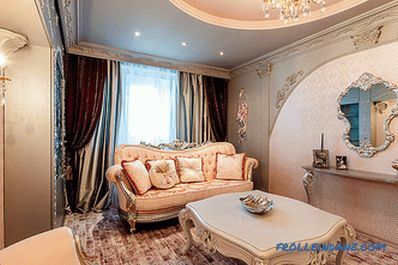 Only at the end of the XVII century Golitsyn, Naryshkin make their European-style residences, after the style gets to St. Petersburg. The style of the buildings erected at that time was called by the name of the ruler (owner of the property). 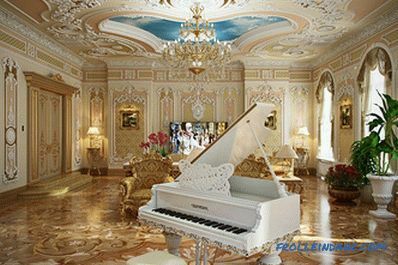 Until now, there are concepts such as Golitsyn or Petrine Baroque. 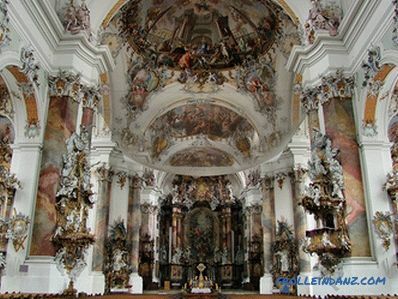 Baroque architectural forms are an oval, rectangle, square, circle. A symmetrical, properly built room with right angles and circles is typical of baroque interiors. Historical interiors in the Baroque style were decorated with colonnades, flight of stairs with marble balusters, portals with paintings and sculpture. In the 18th century, the baroque style in the interior became even more pompous, the symmetry and color saturation of the atmosphere was lost. The rooms began to make out more feminine, tracery. 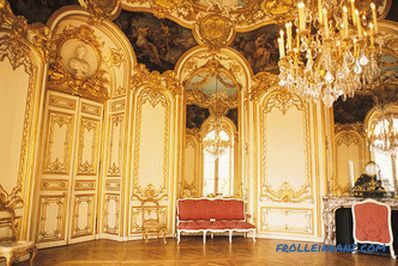 Even more in the interiors became gilding and curls. So, the baroque gradually transformed into rococo. 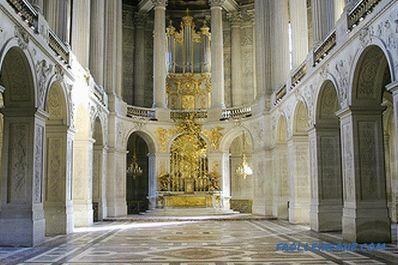 However, unlike the Baroque, it was used only to create interiors. Rococo buildings were not built. 1. 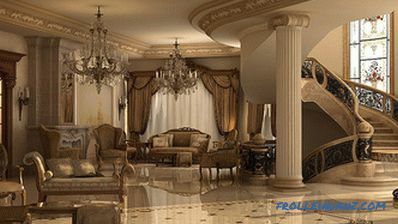 For the Baroque style in the interior you need a large space. 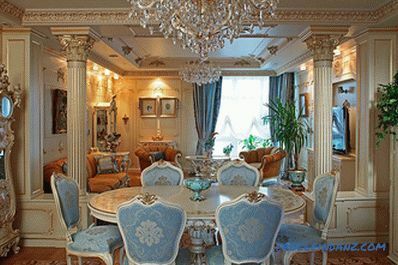 A spacious room with high ceilings can be decorated with columns and statues. The high ceiling can be decorated with monumental painting, stucco rosettes and monograms. The apartment has an area of ​​80 sq. M. m. Baroque style recreate fail. 2. The color spectrum of the baroque premises is saturated. Vinous, deep blue, muted green, brown and terracotta colors are actively used. The most recognizable combination is white and gold. 3. For wall decoration choose wallpaper with the effect of silk-screen printing, embossing, patterned with monograms. 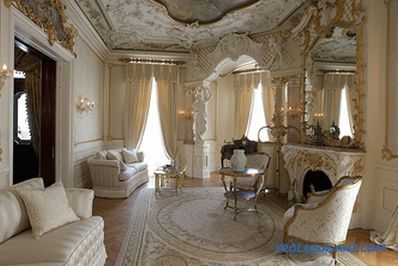 They are combined with smooth plaster, decorated with gilded stucco, moldings, marble and mirror inserts, frescoes. 4. The ceiling is a natural extension of the walls, whose decorations smoothly pass to the ceiling surface. 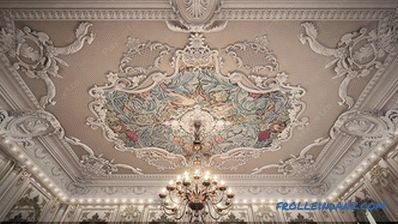 The ceiling is decorated with painting, stucco, fresco. 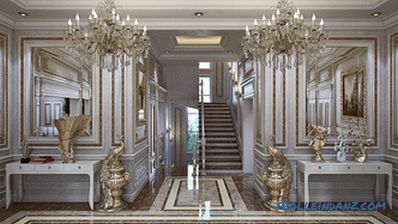 Luxurious chandeliers with crystal pendants complement the elegant and stately look. 5. Floors blend harmoniously into the overall atmosphere of the room. They make out in uniform style with walls and home decoration. For finishing use parquet, laminate with a pattern of natural wood, marble or ceramic tile in marble and granite. From above the floors are covered with warm carpets with a dense texture. 6. Furniture creates the look of the entire room. Each piece of furniture is a masterfully made copy of the master with a unique design. It is decorated with artistic carvings, mosaics, beautiful patterned textiles, gilding. 7. As a baroque décor, recognized objects of art - paintings by famous artists of the XVII - XVIII centuries, sculptures of cherubs, naked girls and boys, handmade tapestries. None of the baroque interiors can do without a large mirror in a chic gilded frame with curls and monograms. 8. 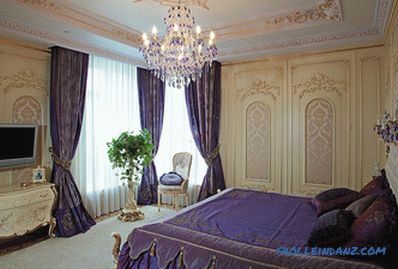 Baroque curtains are recognizable - they are lush, a little theatrical, expensive. 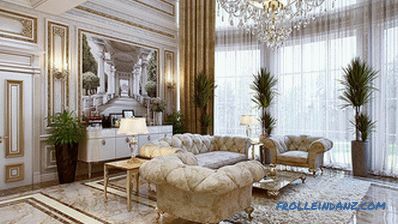 Making the modern interior in the style of Louis XV, it is appropriate to decorate the windows with lambrequins, Austrian curtains, heavy double curtains in the wings. 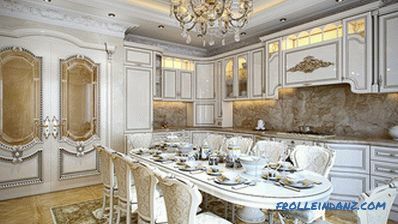 A recognizable combination of Baroque colors - white with gold. He emphasizes the magnificence of the interior, its status. White is replaced with pastel colors. It can be beige, peach, sand. For modern interiors, the use of dark royal colors - velvet blue and burgundy, chocolate brown and muted green is acceptable. 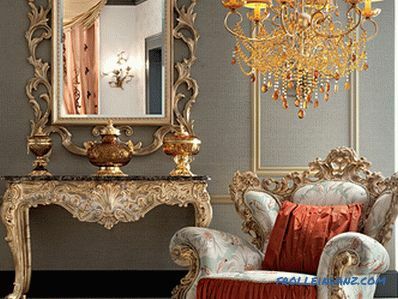 Baroque in the interior is emphasized with a combination of contrasting colors. For example, white and brown. They are used for decoration of walls and ceilings. At the same time, surfaces are decorated with gilded stucco that unites space. Abundant use of ornate patterns, including various curls and flowers, is an integral part of the baroque interior. Patterns adorn the walls, furniture, floor, ceiling, mirror frames, dishes. Each meter of walls is decorated with special chic, filling the space with frescoes, niches, marble inserts, columns, monumental painting and gilded stucco molding. The main task of the style is to hit the guest’s imagination, to delight him, make him freeze in place. 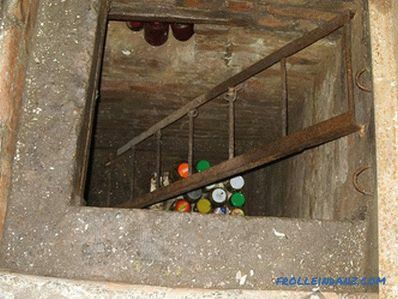 The wall in any case do not monotonous, covered with the same type of material. For her pick up a few expensive materials, combine them and decorate with additional decor. Designers use the principle of dividing the wall into zones to replicate the interior of the palace premises in modern houses. Each zone is decorated in a special way. It is important that the wall together with the ceiling create the impression of a single space decorated according to one principle. 1. 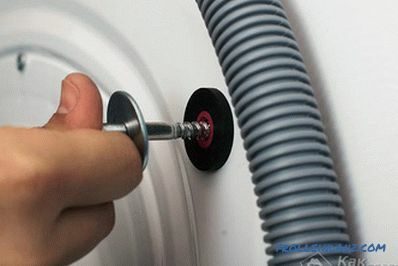 A smoothly plastered surface is covered with a layer of white or light beige matte paint. A stucco cornice is glued along the perimeter of the upper part. 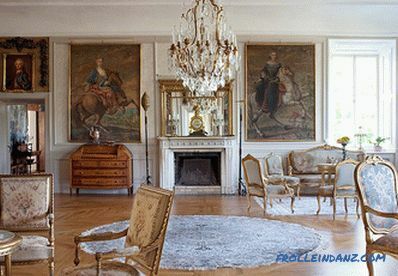 The surface of the wall is decorated with stucco moldings and large mirrors in gilded frames. 2. For the decoration of the wall they use two contrasting colors and gilding. Along the perimeter of the wall they let in gilded stucco, high ceilings are emphasized with columns of marble with elegant carved capitals. On the wall, in the areas designated by the moldings, large mirrors are attached. They reflect the magnificence of the room. 3. Apply the principle of "white on white." For this choose expensive wallpaper with silk-screen or embossed. They make out squares or rectangles on the wall, enclosed in gilded stucco frames. The wall around them is painted with white matte paint. 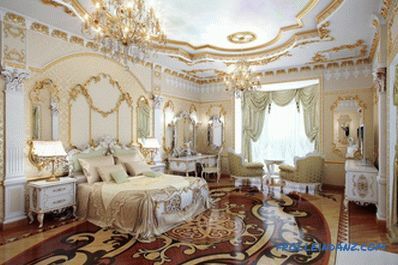 All stucco parts of the ceiling and walls are painted with gold acrylic paint. Portals are decorated with white sculptures in theatrical poses. 4. 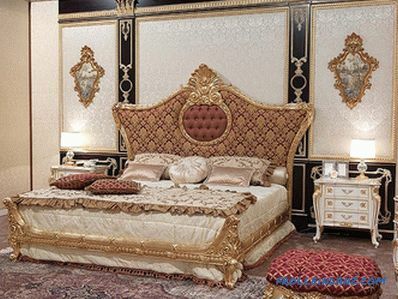 The richness and magnificence of the room is perfectly emphasized by inserts made of marble, tapestries, brocade. 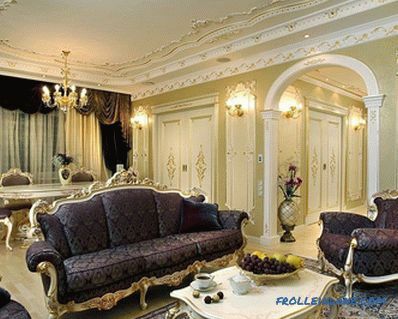 Baroque style in the interior is emphasized by high painted ceilings. They can be spherical, arched or straight. monumental painting and fresco with a remote perspective. Marble, granite, varnished board, and artistic parquet were used for the flooring in historical interiors. Paul complemented the overall picture of magnificence and luxury, but did not over-focus his attention on himself. The floors in the living rooms and bedrooms were often covered with thick Persian carpets with drawings and patterns. Today, for the flooring use laminate, floorboard, marbled tiles. 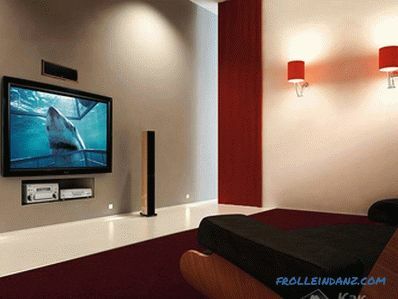 An important condition is the combination with the decoration of the walls and the overall concept of the room. The floor must complement the overall appearance of the room. Today, patterned carpets are replaced with monochromatic or select suitable analogues with bright patterns. 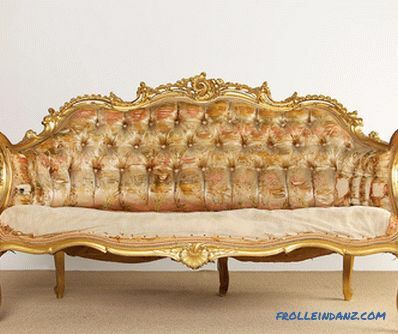 Such a concept as a furniture set appears precisely in the Baroque era. A sofa with a curved back and silk upholstery was made together with the same chairs. They repeated the form, materials, textile design. 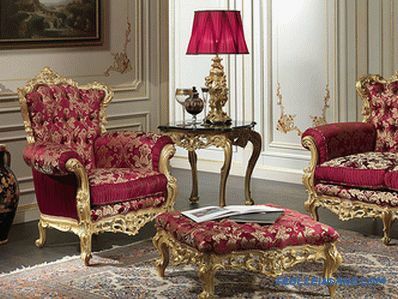 Baroque furniture was made by hand by renowned craftsmen. decorative pillows with hand embroidery . Large dining tables with signature chairs truly decorated the dining rooms. Twisted gilded legs, massive worktops with mosaic and artistic carvings complemented the inlay with a valuable tree. 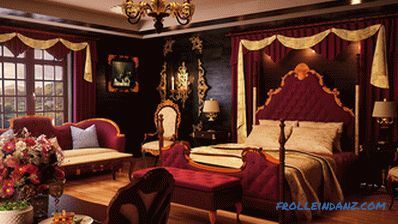 Luxury beds in the Baroque style decorated with canopies; elevated, raising to the podium. To create an interior of the times of Louis XV, modern living rooms are furnished with cozy armchairs and luxurious sofas. They are the same as historical counterparts, have curved legs, high backs, decorated with artistic carvings, gilding and mosaic. In the spacious living room can accommodate several sofas at the same time, forming a seating area. The amount of upholstered furniture depends on the size of the room. 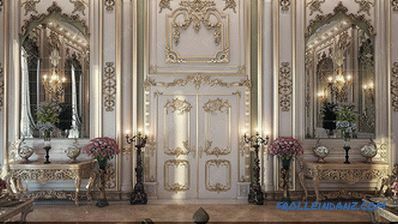 An important role in decorating the Baroque room is played by the design of the walls and ceiling. 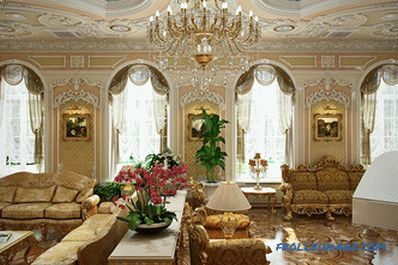 The use of stucco elements, gilded elements, wall paintings creates a royal style in the interior. Baroque in the interior is formed by an abundance of monophonic and patterned textiles. 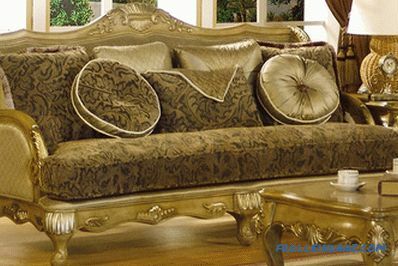 For furniture upholstery, bedspreads, curtains, tablecloths choose satin, silk, brocade, smooth velvet. Fabric binds pieces of furniture and interior together, creating harmony and unity. Usually for the upholstery of sofas, armchairs and chairs choose one type of fabric. Curtains match the carpet or wallpaper fragments. lambrequins with ties, frills, swagami. Textiles are decorated with hooks, gold embroidery, tassels, bows, brooches. 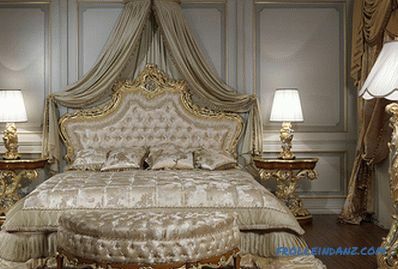 The bedroom creates the image of a royal boudoir with luxurious textile decoration. A quilted satin bedspread covering the bed is complemented with decorative pillows with a frill edge. A natural carpet with a pattern is laid on the floor. The reading and tea drinking corner is furnished with a soft armchair and with a silk upholstery. Bronze chandeliers with crystal pendants gave respectability and grandeur to the baroque interiors. At first, chandeliers served as the basis for candles, the light of which was amplified many times with the help of multi-faceted crystal pendants in the form of an oak leaf and a drop. Candles are inserted into the candelabra, girandoli, candlesticks. Today, baroque chandeliers do not necessarily decorate with real candles, it is enough to pick up bulbs of the appropriate form. In order to properly illuminate a large room, the lighting is formed by zones and high-altitude principle. There are lamps and floor lamps located in the recreation area, reading, playing music. In rooms with high ceilings or stairways, a large central chandelier is complemented by lower lights, lamps and floor lamps. 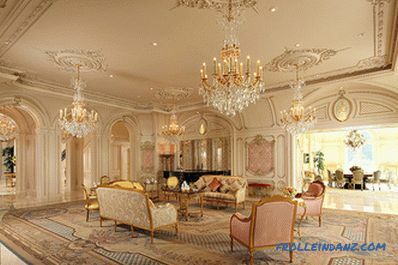 For the spacious hall, select several large chandeliers for 12 or more bronze or bronze or gold horns. They are evenly spaced around the ceiling, decorated with rosettes and stucco. Today, baroque interiors are becoming fashionable again. 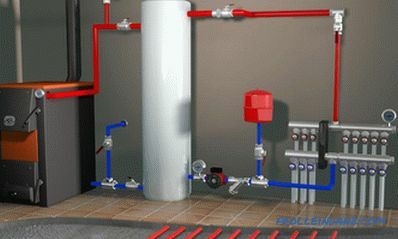 With their help, you can emphasize the status and wealth of the owners. 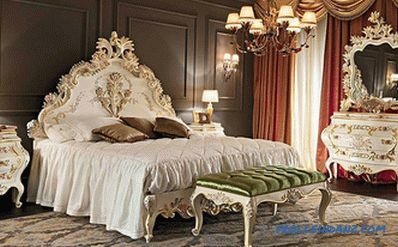 When you make a home, you need subtle taste and following the historically established traditions of Baroque, so as not to disturb the feeling of harmony and elegant luxury.